Though most of the people on the planet will swear it doesn’t work this way, the vast majority of the BS that befalls us is entirely self-inflicted. 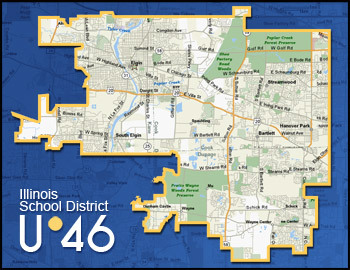 That said, when I turn my attention to the U-46 school district, I gotta wince at some of the chunks of sky that have fallen directly on their heads. First it was the messy departure of an eminently questionable superintendent followed by a good one who decided it was time to move on. Then that insipid No Child Left Behind brand of federal government meddling made the measurements of success utterly meaningless. To make matters much worse, an ambulance chasing law firm decided discrimination was their ticket to a massive payday. And now the district is bearing the brunt of a Kane County Clerk’s office error that placed a temporarily undue portion of the property tax burden on those DuPage County folks who happen to reside within the district’s purview. While it would be fair to say the district may have had a hand in making some of those aforementioned misfortunes a little bit worse, they had absolutely nothing to do with this particularly taxing situation. Basically, the Clerk’s office made a very simple, but significant error by under-calculating the total U-46 Kane County property tax value. And just as it is in Newtonian physics, there was an immediate equal and opposite reaction sending DuPage County tax bills soaring. More simply put, DuPage County U-46 residents are subsidizing their Kane County compatriots this year, but as soon as the appropriate remedy can be legally applied, the converse will hold true next year. In 2016, balance will finally be restored to the taxation force. If you’d like to further delve into the details, Courier-News reporter Dave Gathman’s done a really good job of explaining a very complicated situation. With the absurd complexity of the Illinois tax statutes, the vast number of taxing bodies, and all those overlapping boundaries, this kinda thing actually happens more often than you’d think. The problem in this instance is, the miscalculation is greatly magnified by the sheer size of the school district. Harkening back to the title of this piece, armed with all their pitchforks and torches, instead of directing their dismay at the Kane County Clerk’s office, those exceptionally unhappy DuPage County residents are aiming all their vitriol at those “spendthrift” U-46 administrators and the board. There’s already been a rather raucous August 12 town hall gathering. Of the late August school board meeting, Gathman reported, “It was one of the angriest and most unruly crowds of any meeting I have covered.” (And that means a lot coming from Dave.) There was another somewhat more sedate Bartlett Town Hall last night. Look, no one understands that these kinds of mistakes can be made better than me, so the fact that they happen doesn’t surprise me. But what does surprise me is that no one from the Clerk’s office has taken to that podium to explain exactly why the error occurred and just how it will be redressed. There was a County Clerk staffer in that town hall audience last night, but she didn’t step up to take any questions. Meanwhile, through no fault of their own, U-46 is facing the very real prospect of an incorrectly energized portion of their tax base coming after them with one of the worst collective cases of ADHD I’ve ever seen. Glenn Beck is the only one who could possibly come up with wackier theories. When those adjusted tax bills come out next year, given the far greater percentage of U-46 Kane County residents, it’s gonna be exponentially worse. But the real complication could be, if this sudden burst of angry taxpayer energy coalesces into anything like the blowhard taxFACTS gaggle who relentlessly harassed the Geneva School Board for years to no positive effect, Katie bar the door, it’s gonna get ugly. At least that Geneva school board brought some of it on themselves by going a little crazy with all the new school buildings. In this case, U-46 did absolutely nothing to deserve the current onslaught. Perhaps the Clerks’ office will send an emissary to the U-46 September 15 school board meeting to diffuse this semi-volcanic situation. I’ll keep you posted. ← Here’s the September 11, 2014 Left Right and You promo!